Tighten rules for senior citizens who drive? At what point should elderly drivers be taken off the road? America Online reports that elderly drivers now make up almost 20 percent of all motorists. And that number is growing as the Baby Boomers age. It's no surprise that one recent survey shows almost one in 10 adults are worried about an older family member driving. Experts say the top thing is to understand the importance of mobility for the elderly. Driving gives them a huge sense of independence and autonomy. They suggest if you're worried about a family member's driving, you should take a ride with them and watch. And then, if necessary, have a conversation about it - a sensitive topic, for sure. Stopping in traffic for no reason, difficulty staying in the same lane, getting lost in familiar places, being easily distracted or irritated while driving, difficulty turning around to see when backing up, loss in confidence, other drivers often honking horns and scrapes or dents on the car or garage. Clues, one and all. There is no specific age when the elderly have to stop driving. But there comes a point when they become a danger to themselves and others. Many states have special requirements for senior citizens to renew their licenses. Sometimes they have to apply for a renewal more frequently. In some states, they need to retake road or vision tests or renew their license in person, instead of through the mail. Here’s my question to you: Should the rules be tightened for senior citizens who drive? I believe the DMV should modify testing after 70... My father exhibits all the signs and denies all of them. He stops at green lights, goes 40 on the highway, constantly cuts people off, etc. And he just interviewed for a job delivering pizzas. Lord help us! I think you and everyone else should leave the senior driving situation ALONE. Remember, you too will be a senior one day. As for me, I do not need for you or the government to tell me when to quit driving. In case you are not aware, most seniors are full of common sense and will know to put our keys away when the time is right. Absolutely, and I am 64 years old. It was virtually impossible to get my parents to stop driving even though they were accidents waiting to happen. In both cases, we had to take action with the State to get their licenses revoked before they killed someone. My only serious auto accident was when a 92-year-old man ran a red arrow and I hit him broadside... The D.A. plea bargained the old fellow down to revocation of his license rather than 90 days in jail. I wouldn't want him to spend time in the slammer, he didn't have much left. But I also didn't want him back on the highway. Hi Jack. My father-in-law lives with us and still drives. He is 84 and loves his independence. We also like him staying alive and not killing anyone with his Cadillac. After 70, there should be an actual driving test with a human being to maintain your license every two years. Dad is selling the Caddy when he turns 85. I am one and I scare myself. Maybe we should set up sanctuary cities for seniors. It seems to be working quite well for illegal aliens who crash cars with no insurance and just walk away. Not until I reach 90... in 20 more years. Absolute thresholds are silly, but frequent testing for the elderly is anything but. When their judgement is bad insofar as distance, and they are driving 10 miles an hr in a 35 mph area. I've seen young people with poor judgement and unable to think quick enuf as well. Jack: I know people who drove their cars until they were in their 80"s, because they had no other transportation. Many cities and towns do not have bus service, whiich means grocery shopping, doctor visits, and pharmacy trips must be done by car. We have talked about mass transit for 30 to 40 years, but no funding to accomplish it has been spent. Do not take cars away from the elderly until some type of transportation can be provided to take the car's place. Jack, subjective question. Solution? Buy some of the junk ever-lower-costing car insurance FOX stations deafen us with endlessly and take your best shot Gramps.....not that I watch FOX. People are too old to drive when their reflexes, judgment, and senses no longer meet minimum standards. How will we know when that is? Every driver over the age of 65 should have to have an in-the-car driver's test every year in order to renew their driver's license. Jack, I live in a retirement area and I can tell you that very old drivers are more dangerous than teenagers. It is up to friends and family to keep an eye on their loved ones, and when they refuse to keep up with the flow of traffic or wait forever to make a turn and then pull out in front of someone because they get flustered, it's time to take the keys away. Period. They should be tested at least once-twice a year after they reach 70. I've seen many accidents and close calls involving old people and we cannot jeopardize the public safety for their vanity. One is too old to drive when one thinks he can predict the presidency in two years. The way some people drive, I figure 10 minutes after they pass their first driver's test. When they do not have the mental and physical capacity to drive at minimal acceptable standards. It is not age-related, you could have said "too young to drive" just as easily. The problem is that driving tests don't test how people really drive, they're on their best behavior. If the test were reality, the roads would be a lot less crowded. It depends on their ability. For instance, are they drunk, drugged, blind, deaf, unlicensed, cell phoning, texting, etc? Let's face it, their are some bad drivers who just shouldn't drive. Oh, good luck with that! Have you ever tried to take the keys away from an elderly person? You'd have an easier time in taming a Mountain lion. All you can do is have the DMV do the dirty work for you. Let them make the decision. Unless you don't want your inheritance. when they start believing what is on Fox "News" because that would demonstrate a severely diminished mental capacity that would make them dangerous not only on the road BUT also in a voting booth. Age is not a valid objective criterion for driving. Some folks are never too old; others are too inept before they turn 20. Let's hear it for more sensible approaches to deciding driving privileges. When they are not capable physically, mentally, or emotionally. It doesn't matter what age they are. I live in the Phoenix area Jack. Two or three time a week I am in one of the retirement cities in merto-Phoenix. My experience driving amonst the elderly motorists has shown me that, when a person is afraid to drive at a speed that is more than 10 mph below the speed limit, that person is too old to drive. When they cannot control the vehicle have to many accidents. It's your actions behind the wheel that dictate whether you should continue to drive or not. Not until I reach 90 in 20 more years. When they can't see over the steering wheel, can't see in front of the car, and they can't reeemember which is brake and which is clutch. Rules need to be changed for everyone who drives, let's start with NO CELL phone use at all. I don't see senoirs texting and driving and weaving all over the road. Maybe it's time that all Americans be required to take a course in manners, not just driving. Please, yes! My 85 year old dad still drives because his 85 year old wife makes him. Give him and the rest of us some peace of mind. At least ban 85 year olds from the interstates! I am one and I scare myself. What is really scary is the people who are smoking dope and driving and of course the illegal immigrants, neither of whom have any insurance. Seems like for some strange reason, Obama and the libs have not yet decided that everyone should have auto insurance and decided to reform it. Only if the rule change accomodates the elderly who still live on a working farm or ranch. Yes, absolutely. There are two issues with 'elderly' drivers. First, let them 'keep' a valid license, it gives seniors a sense of 'independence, which is good, second, retest drivers beginning at 65 or 70 for 'current' driving skills and perhaps etablish times of the day at which different driving levels can drive. Should the rules be tightened for senior citizens who drive? How about closing nursing homes and sending the elderly home to their families to care for them? That includes driving them around. That is the MORAL thing to do. Those that have no family have to rely on themselves. That includes driving on the same roads as teenagers! When you take care of seniors for many years, like I have, you learn how deeply important driving is to them. Lost independence eats at their very soul, but most care more about safety. Helping them face the changes in their ability to react can be tough, but it can and should be done. People who love them cannot be cowards about facing this responsibility. Only if states and municipalities are going to pay for and provide them with safe public transportation instead. These elderly people still have to eat and get to the hospital Jack. Some don't have children to take care of them. If you take their drivers licenses away from them then they can no longer provide for themselves without an alternative to driving. Absolutely. After a set age, let's say 75, the presumption should be that you're no longer allowed to drive. If you can prove otherwise through a rigorous test, fine. But the hard truth is seniors behind the wheel are flat out deadly. Yes and no. Driving tests should be a mandate after 20 years of driving for all people just not the aging. The younger kids need more driving time while learning to drive and turn off that stupid cell phone. You are not that important. Well, let me put it this way Jack, if you're old enough to remember when there were no cars, then you are too old to drive. My mother is 81 and drives just fine, she has great eyesight and reaction time. In New Jersey senior citizens are picked at random to be retested for their license. I did live in South Florida for a while and I do know of many instances that senior citizens (of which there are many in South Florida), crashed into the bank instead of just parking and also where they left their house in West Palm Beach and ended up 5 hours later in Tampa not knowing how they got there. They should all be tested more frequently but I do not believe there is a certain age that they have to turn in their license. Yes, they should be required to be driven around by their children.. The closer I get to 70 years old, the less I like the idea. As long as their health and vision does not impact their driving, they should continue to drive. Even though their likely the only group out there not talking on cell phones or texting while driving, people over the age of 70 should be mandated to demonstrate they are still capable of driving safely with every license renewal, however this will be a moot point in another 10 or 15 years when most cars will likely be able to drive themselves anyways. Jack, there are bad drivers in all the age groups – why focus on one group? I see a lot of bad driving that seems to be more rtelated to the fact the driver is on a cell phone. Rules and requirements should be tightened, and enforced, at all age levels. I'm always amazed at who gets a driver's license these days. People are not interested in driving dynamics, how to control a vehicle, rules of the road or common driver courtesy. Think about that everytime you see an on-coming car in the opposite lane traveling at 65+ miles an hour,driver on the phone or distracted by children, and all that separates you from death is a line of paint. In reality, only about half the people out there should be allowed to operate a motor vehicle. It is supposed to be a privelege, not a right. Don't take them off the road. Just re-test them to see if they can still drive. You can't have a blanket rule for everyone. Setup a series of tests, maybe starting at 65 and every three years after to make sure that they are capable of driving in a safe manner. I think their accident record should raise the need for a re-evaluation. Drunk drivers get many chances before losing their license. If the older drivers are not causing accidents or getting lost, it wouldn't be fair to impact their independence – bad drivers at any age should have to pass extra proficiency exams. My father in law lives with us and still drives. He is 84 and loves his independence. We also like him staying alive and not killing anyone with his Cadillac. After 70 there should be an actual driving test with a human being to maintain your license with a human being, every two years. Dad is selling the caddy when he turns 85. I think you and everyone else needs to leave the senior driving situation ALONE. Remember you too will be a senior one day and as for me, I do not need for you or the government to tell me when to quit driving. In case you are not aware, most seniors are full of common sense and will know to put our keys away when the time is right. Yes they do. I turn sixty this year and have noticed my own abilities waning. I would be delighted to retake driving tests, not only for my own safety but others. Plus, in the forty-some years I have been driving the laws have changed. I welcome a chance to refresh my knowledge of the rules of the road. Getting old folks to take a drivers test would be like getting a Texan to take a test in gun safety before being allowed to buy one. Folks just have to have the freedom to threaten mine. lane they are in who are in their 20's. and driving history rather than age, Jack. I think rules should be tightened for seniors but also for everyone! There are enough bad drivers out there that I believe we should all have to retake the driving test every X amount of years as a refresher. The "rules of the road" change often enough that a refresher would be a good thing, besides, this way we aren't singling out a specific population. Yes, laws should be enacted/enforced in an effort to keep the roads safe. Seniors driving poorly present are a danger to everyone around them. How many innocent people have to die at their hands before action is taken? Most seniors will not give up the keys on their own, and they've demonstrated through voting their distaste for having driving priveleges restricted. It would be best for all parties involved to take action. Each person's capabilities as they age are different, so there shouldn't be any cut and dried rules. I live in a state that requires you to renew I person and have a vision test when you are over 70. My father who drove a cab for a living gave up on his own in his late 80's. All well and good to propose new rules – how do they get enforced? how does such a move affect rural families? how does yet more government improve anyone's life? Senior drivers absolutely should be tested to renew their driver's license. If they have the physical ability to safely drive their car, they have nothing to worry about. The fear and opposition they bring to this argument shows that they know the right answer, inconvenient as it is. How to get around in our senior years should be part of planning for retirement, just like saving a nest egg. An individual's decision to live in rural Alabama (referencing another comment) is the same individual's consequences to accept. The whole of society should not be subject to an unsafe driving situation because it's convenient for the elderly. I Think Your Medical History Should Kind Of Determine Weather You Should Drive! If Your Old And Have Vision Problems, Or If Your Just To Old Maybe You Shouldn't Be Driving But Someplaces Don't Have Public Transportation So Then What Do We Do? Absolutely! We are so lucky that my mother-in-law did not injure herself or others when she drove between the age of 75 and 80 . She was fiercely independent , but we made her stop driving at 80 when we saw an unexplained dent the size of a basketball on her front bumper. All drivers should have annual license renewals after age 75, and I promise not to complain too bitterly about that restriction when my time comes! This needs to be viewed on a case by case basis. My husband's Aunt was in her early ninties and was scooting around DC better than some forty year olds. Then again, an eighty-five year old man never stopped at a stop sign coming down a hill and would have killed me if I hadn't anticipated the coming crash. Family members need to evaluate the elderly driver and then have "the conversation" with the person. Providing other accommodations will make the matter easier. If they really are not fit to drive- get them off the road. It is frustrating to repeatedly hear of fatal accidents caused by an elderly driver in which an entire family is killed and the only survivor is the elderly driver. Regardless of how 'sensitive' the subject may be, the elderly are destroying lives and families and this issue is overdue for resolve. Seniors should be required to take driving tests as well as written tests each time their license is renewed beginning at age 65. Anyone capable of passing both types of testing has nothing to be apprehensive about. Absolutely! How many times have I come across someone who is driving irratically to eventualy pass thaem and notice that they can barely see over the sterring wheel? How many times are we going to see reports of a senior "mistakening" the gass pedal for the brake! Come on! this new "tightening" needed to happen years ago!!!!! Most assuredly. After 80, requalify the driver tests and visual acuity, every other year. Too many cannot see to react or their reaction time is grossly diminished. They are more of a threat than a teenager who has just received their license. Of course some older folks shouldn't be driving, however, that doesn't mean ALL older folks fall into that category. Might be we need some legitimate testing to determine who should continue to drive and who needs to be a rider. I'm a senior, and I think that everyone over 60 should get a yearly driving test. In Ohio a vision test is required at time of renewal (every 5 years). If they were to supplement that with a written test every 10 years, I think you would see many not be able to renew their license and this would be a good thing! Recently a seventy-five year old man and his wife were driving home from dinner out, when a 35 year old man swirved into their lane hitting them head on and killed the elderly man, and injuring his wife. The 35 year old driver was charged with his 9th DUI. Although I agree that testing should become more often after a certain age, I can't say that elderly people are the main cause of accidents. Absolutely! Just as there is a required driving test for a 16-year old to get a license, there should be a required driving test for a 70-year old to keep a license...and a 72-year old...and a 74-year old...and so on. A 95-year old man drove smack into our center city house a couple of years back. Thankfully, everyone was fine, but that was pure luck....and luck shouldn't be left to chance. I think there are more accidents from people who are not seniors. I also think that since the "senior" has paid the taxes to build the roads and the schools that educated all of us, we better think twice about taking his rights away without cause. With the automobile technology coming for rear viewing, backing up, parking, keeping a car in its own lane, there might not be too many driving decisions for people to make on their own in the next couple of years. Let's not make laws that might not be able to be repealed like our health bill. While there is always a few drivers that will go against the odds, the majority of elderly drivers pose more of a risk on the road. For one, 50 years ago, driving was much slower. Speed limits have since increased, as has the age of younger drivers in a hurry to go places. Not that it is an excuse, but more of a reality. One proposal is to require all drivers to have a driving test every two license period re-newals. This would reduce the number of poor drivers, both young and old, while adding jobs and money to state governments. Sure, it would be an inconvenience, but I would trade it in a heartbeat to remove the teenager/young adult/mini-van soccer mom/mid life crisis guy/elderly golfer trying to park their crown victoria from causing more of a traffic jam or wreck. I am struck by the number of comments which identify 70, or even 65, as the age beyond which competence should be questioned. I assume that most of these are from people well short of 70. But everyone I know in their 70s drives just fine. Or at least as well as younger people. It's the 80s when problems can arise. What do you do when you live in a rural area WITH NO MASS TRANSPORTATION system and no family?? Wait until you young things get our age!!!!!!! As long as senior citizens vote in greater numbers than other groups, there will not be as many restrictions put on them as there might be. The politicians don't want to rile up the older voter by being seen as reducing their mobility at the expense of the public safety. Look who has the accidents. Its not the elderly it is younger people. But– every time someone over 65 has an accident it is front and center in the news report. Not so if you are only 40 years old. No, if you don't like the way they drive get off the sidewalk. Absolutely NOT! There is no reason to put restrictions on every senior just because a few of them who have issues. Perhaps require an annual driving test but that is about as far as it should go. YES! At a certain point they become dangerous. My grandfather was a fighter pilot in WWII and Korean. He was smart, still felt he could do anything, and was very independent before he pasted away. He refused to stop driving and got in a few minor accidents. I loved him, but we took away his keys. He called the dealership where he had been buying cars for decades and they delivered him a new pair!....I told you he was smart. I know it feels like the end of their independence, but at a certain point if they can't pass a driving test, they should not be able to drive. I feel lucky that he never injured anyone. Yes there is a time when some people should stop driving, that is nothing new. What I believe is more of a problem is the eractic, distracted, aggressive driving being forced on all of us by half the drivers in this country. These bad drivers make it dangerous for older drivers and drivers that follow traffic laws. Also, if all our cities made mass transit a priority, a person who no longer felt comfortable driving would not need to give up any freedoms. Why do we make things so difficult for ourselves? Let's concentrate on real solutions. I'm a young Senior Citizen (at age 62. ).....I say okay....but with exception. I think that the banning of cell phones and texting while in motion should be addressed first. Some YOUNG person almost broadsided me just this morning whlile failing to yield the right of way. She was far too busy in her own little communications world to worry about anyone else around her. VERY SELFISH and DANGEROUS. Wish they had invented phone booths with wheels to see how mobile telephoning worked before introducing the cell phone & texting to the "MY comforts are more important than anyone else generation". Its not an across the board fixing. A 91 year old man with his 89 year old wife were just trying to get into their driveway. A sheriffs car slammed into them and killed his wife. He did nothing wrong...the sheriff was doing 90 in a 45. My mother is 85 and does not venture far from home anymore. But she gets to her senior doings in her town. Its up to the children of elderly parents to help make them make that decision if they can't. If you tell an old person they can't drive anymore, you are signing their death sentence. Hell no!.......not until laws are effected banning texting while driving. Why anyone would not consider banning texting while driving an absolute must is beyond my 65 year old reasoning. I am 82 and an ex-military aviator. I drive a 300 hp sports car and drive it better and more sfaely than the idiots I see every day talking on cell phones and texting while driving. Driving,like flying,is a learned skill that depends on attention to detail, reaction to stimuli, plus experience and background. When the attention and the reflexes go, one should not drive or fly. If one still has the attention and the reflexes age is not material. I think that when seniors get to a certain age that there should be periodic driving tests that they should have to go through to maintain their license. I've seen some elderly people on the roads in my small town and sometimes I wish that they didn't have their license. Anything we can do to prevent accidents on the road would be greatly appreciated. I don't like the idea of "ageist profiling," but I'm 61 and getting closer to a time when I should not be allowed to drive. As we age, we lose our skills and reflexes. We lose them at different rates, but they go. I really HATE to think that I might not be able to go where I want, when I want, because I want to, but I think my wants are of less importance than the welfare and safety of the larger community. And I think that should be true for all of us. I know an elderly lady, 96 years old... she drives WONDERFULLY. Also, she climbs up on her roof and hangs her own christmas lights, did I mention her vision is 20/20? Some people can def drive, some cannot. Should be retested more often. My mother is 84 and still driving. I don't have to watch her drive to know how bad of a driver she is – I can tell by the dents on all four corners and one side of a three year old car. She gets lost driving to the grocery store that she has been going to for the last 40 years. Unless the law requires her to take a test, I have no way to prevent her from driving and live in fear that the next accident will be much more than a dent. "Not for me to point fingures, but I stopped driving years and years ago! I can't afford it now! It all depends on Reflects, Eyesight, and physical movments?? My reflects are dead, with the amount of traffic and traffic-signs!" Jack. I seem to recall all those emails I sent to my state senator and assemblyman urging tighter controls over senior citizen licensing – like annual medical form submitted by a doctor saying his/her patient is fit to drive, and a required AARP driving class every other year. As for an age limit, hell no! Oh, by the way, I'm 74. Yes!!! They should at the very least have their driving abilities reevaluated more often than others. They shouldn't get automatic renewal as they do in California. Everyone ages differently, so I would say no to an age limit, but yes to an annual driving test. I live in an area that is a popular retirement destination, and it is not uncommon to see elderly drivers on the wrong side of the road, or driving below 5 mph because they are not able to see. That's just plain dangerous, and needs to end. I really don't know any senior adults who have been in a rode accident. I do know many younger and middle age who have. A good percentage have been stopped for drinking while driving.. What are the stats on that Jack! Jack, stopping in traffic for no reason, difficulty staying in the same lane and all the other things you listed are some of the very things I see young people doing today. Many of them no longer drive and text. They simply stop or slow down when driving and completed their text. That having been said age should not be a deciding factor. I am of the opinion the rules should be tightened for the “Junior Drivers”. If the individual situation warrants it, then yes, but not a blanket policy. It’s like the shooter in Tucson, where do you draw the line on who can drive or who can buy guns? I don’t think we oldsters need to take that written test, but there’s nothing wrong with requiring us to prove we can still handle a vehicle properly after a certain age. I mean more than just a spin around the parking lot at the DMV. I live in a community of about 20,000 where retirement is the primary industry & the average age is 59 years old. I can say beyond a shadow of a doubt older drivers (70+) are every bit as dangerous as early teen drivers. There needs to be an in person eye exam & drivers test every two years for drivers over 70. Take the burden off subjective determination & make it performance based. You have not lived until you've been in a car going SB on Highway 1 in Carmel, CA and driven by a 95 year old. Even I prayed. Why not check all pedestrians at random if they appear to be confused while walking, or have dings on their front porch or shoes, or stop on a crowded sidewalk for apparently no reason, or can't turn around in a crowded subway station. Ought they not to be brought in for re-evaluation? Restricting the seniors will make them feel inferior which i dont want it to happen because we the young people will definitely become old one day. So, those people making that decision should remember that we all will get there one day. Well, at minimum, they should at least be able to see over the steering wheel. Tightening up restrictions on senior citizen drivers is one more way that our senior-hostile society attempts to sweep them under the rug, as though out-of-sight out-of-mind assures the rest of us of never growing old. I see atrocious, dangerous drivers everyday and the vast majority of them are anything but senior citizens. Take away a senior's driving rights and you take the last meaningful vestige of self-reliance and dignity from him. Far better to crack down on all the rest of us horrendous drivers. Jack, I am 76, have not had an accident in 60+ years, scored 100% on my CA Drivers test @ 75, took the AAA senior driving video etc. Now I suggest you walk on a busy street and witness the "young dudes", soccer moms, hyper exec types, roll through stop signs, run yellow lights into red, never use turn signals; then go onto the freeways here in LA and be horrified at the texting, cell phones and make up applied while driving. Then try and avoid the big rigs with 40 somethings jockeying going 70+ in three lanes forcing everyone else to "make room for them". Once you "fix" these younger drivers excess and law violations...you can come down on me and other seniors. In most cases we are not the problem. My grandparents were smart enough to take themselves out from behind the wheel as they got older; they knew, as their bodies and eyesight got worse that it was necessary for their safety and everyone else's. The family made up for it by making ourselves available to drive them wherever they needed to go. My grandfather died in 2001, my grandmother just turned 94 at the end of Dec. I'm over at her house at least once a week to pick up her grocery list and do her shopping, if I can't make it, then my aunt or uncle or cousin does. If every family would take the same approach it wouldn't be such a touchy subject. Elderly people on the roads tend to put other drivers and themselves at risk of accidents and even worse. Driving under the speed limit in the passing lane, changing lanes without looking and seeming to have no idea what is going on around them are all signs that their ability to drive is questionable. All it takes is one person driving under the speed limit to cause traffic jams and accidents. Some if not a majority of accidents happen on the roads do to slow drivers. Road rage is also another side effect of people driving slowly. Restrict the left (passing) lanes from the elderly and require them to have a test annual to keep their licenses. Tighten those rules! I think that it's silly for the government to impose special driving regulations on senior citizens. If a family is concerned about an elderly family member driving, the family should handle it privately and talk to the individual about hanging up the keys. I believe that the government should spend its money and time on other more important issues. I have seen some pretty bad drivers in the their thirties. Not all that impressed with many drivers in their twenties. Have seen great drivers in their seventies. Talk about age discrimination! The elderly built this country and because SOME drive poorly we want to punish all? That is pathetic. But that is what we do in this Country – we overreact to everything. I am against general rules based upon age for driving – teenagers, senior citizens, etc. I think people should be judged based on their own individual level of responsibility and ability. Nothing else should be a factor. As a person that drives all over Phoenix AZ (Snowbird Capitol of the World), I think that there needs to be some cut off point, or there needs to be hazard signs to indicate elderly people driving. I am 65 and live in a 55+ retirement community. I watch many of my neighbors who use their walkers/wheelchairs because they can barely maneuver to get into their cars and I shudder. If they can barely walk there is no way they can react to a crisis situation. The mind may be working but the body certainly is not capable of fast reactions. I know I will be there someday soon and hope that I realize I need to stop driving before I kill someone. Jack – As a 74 year old driver with no citations over 50+ years, please permit this question . Who the hell are you talking about? There are far more under 18 citatations being issued that there are over 65. Look at the numbers pal - we old people drive carefully. I'm 63 tomorrow and would have to say 65 is a bit young for annual testing; I'd vote for every 2 years at 70 and every year at 75. You ought to see how some 20 and 30 year olds drive here – it's pretty scary – so if we go for retesting for the older ones then I suggest every 5 years for those younger. My father is 85. He can hardly walk, or stand up. He is having back surgery next week. He should not be driving. He refuses to believe that he does not have control behind the wheel. His reactions are so slow. If he does not stop driving, he will be in an accident. One just hopes that other party is not injured. Both my parents do not realize that they are at risk by driving. Physically, mentally, an financially. Should something happen that is their fault- they could up end being sued and loose all they all. Where would they then live, or pay for additional health care costs. It is hard situation, as one day I may be in their shoes. I am 79 years of age. I had planned to give up driving at 80 years of age, in 7 months. But I know my reaction times are not what they used to be and see no reason to endanger others so my stop driving in the very near future. Driving is a privilege, not a right. As we age, we often experience a loss of vision, reaction time and cognitive abilities. It is very easy to hit what we don't or can't see (often the case when elderly drivers back-up or change lanes). Also, another indicator of unacceptable driving is that a numerous property damage accidents is likely to result in eventual personal injury or worse to another. The driving "right" should not trump the safety and well-being of others. I already told my family to take away the keys before I inadvertently convert my car into a weapon. The fact is that old people's motor skills deteriorate. You can't generalize – everybody is different – test seniors over 75 every 2 years – I would be fine with that. Seems to me its the 20 somethings who drive like idiots and cause a lot of the accidents – men and women – maybe they should be tested every 2 years also!! I would love to read your comments on this issue when you reach 70 years old. I am a senior citizen. I am also an airline pilot and willing to test my reflexes against yours any day you choose! Frankly, from what I see, the real road dangers come from many youngsters who continually drive while texting on their cell phones.Look around while you drive and you'll see what I mean. These are the people who provide the real hazards that you want to throw on the backs of senior citizens, Besides, most of the senior citizens are in bed by 10 PM. See how many accidents occur after that time!!!!!! The law needs to watch more closely the drivers that are 18 and under who talk, play radio, text, eat, and have more passengers than necessary in their cars. I have been driving since I was 16. I am over 70. I have no tickets or accidents against me as a driver. I am not against being retested on any level to keep my driving privledges. Stop beating up the old folks because of their age and concentrate on the really bad drivers of the roads. I don’t mind being tested to ensure that I am a safe driver. I actually think it is a good thing. What I would object to is inequality in the process of deciding who is and isn't a safe driver. I would like to see all drivers take a written examination and potentially be selected to undergo a road test with a state trooper or a private driving examiner when they renew their driver’s license. We would all be safer. Jack–This is a problem in this car-centric culture of ours. My mom drove until she was 92 and quit on her own. She drove since she was 16 and never had an accident. I see much younger drivers getting into accidents all the time. The real solution is to get away from this obsession with the automobile. We need more extensive, reliable, affordable, and state-of-the-art public transportation. Tightening the rules will not get most of the careless, distracted driver off the road. A lot of drivers don't feel comfortable driving but what is the alternative in this country? There is none. My driving at 70 is not near as dangerous as a 40 year old talking on a cell phone. Testing every 5 years after age 70. I'm 72 and still driving great! It would be the end for me if my lic would be taken away. How about going after some of the text messaging fools and phone talkers.... they are the ones to go after. Seniors with dementia should be stopped, but we all have senior moments some earlier then others. If older drivers are indeed so suspect why then haven't the insurance companies reflected it in their rates? With their arcane database you'd think they'd be the FIRST ones to notice any trend in age-related accidents. Who needs more gratuitous laws? Let the private sector handle it! Yes. Will this happen? Probably not. No politician will do the right thing. They will kiss the senior block because they vote. Just stay alert and stay away from headless big cars. I am almost 74, maintain a full work schedule advising some three dozen CEOs and company owners, and remain as sharp and focused as any of those with whom I work. However, I also drive more carefully (but not slowly where that would create danger), take time to drive "right," do not text or email or use my phone (unless totally hands-free), etc. That said, I am all for more frequent testing of older drivers...say, every two years until 80, maybe annually (on key measures) after 80. Who wants to get whacked while on the road; worse yet, who would take a continuing chance on harming another? Getting older is not all it's cracked up to be, but it does not mean we have to be selfish or dummies. Renewed in 2010, good till 2015.took all the test my doctor wanted, came back like I am 35 not bad for 65. Smoke, drink, raise hell every day, that the way. 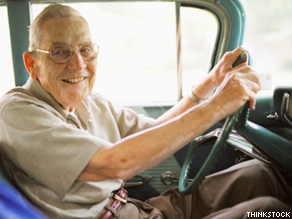 The majority of elderly drivers are better drivers than most teenagers. Having said that, my mother drove well after she shouldn't have. She had macular degeneration and would creep the two blocks to the grocery store, even though there were great holes in her vision. After an accident, fortunately without injuries, she decided to give it up. On the other hand, my aunt had her car taken away by her son. She called a cab and went to the dealer and bought a new one. I have no answers but I do not think there is an absolute age. I have hit curbs and garage doors all my life so that should not necessarily be a clue. Accidents and/or vision problems would probably be good enough reasons. Sounds like a form of profiling to me. You are old so you need to be tested because you are probably a bad driver. A persons driving record should be taken into account. I have been driving for 53 years, have had one ticket for coasting thru a stop sign on a rural road when I was 40. I have had one accident which happened when I was stuck in traffic and was rear ended while stopped when I was 27. Either I or family or friends will be aware if my driving ability starts to diminish. An eye exam every year might be a good idea. At 68, I figure skate and can do at least a low-level jump; my balance and my reaction time is excellent. On the other hand, many of my age are not so fortunate. A mandatory biennial test on reaction time and vision would not be an inconvenience...simply a driver's training simulator would be enough to catch impairment. If you can't appropriately see the situation and apply the brake, you shouldn't be driving. Unless your Mr. MaGoo, then yes, Jack. What does a comparison of the statistics between age groups show? Let's say group "A", 16 to 21 and group "B", 66 to 71. Jack, Iam 58, and my fiancee is 70, we watch your show regularly, we both think the seniors have lost too much in this countr;y, our social security has been "barrowed from" and mayu disapear for good with out our permission, and we loose rights everyday, and maybe our right to drive! When will people realize that we are all getting older and becareful what you vote for you might have it come back and bite you where the sun doen't shine! Be our voice and keep Americans Free, of all ages!! Sincerly, Deborah Melchi, Fremont,.In. Smalltown USA!!! Absolutely seniors should be retested with both the written and driving tests. Too many seniors are at risk of injury to both themselves at others on the road. It is ludicrous to believe that a person can drive up until they have a serious accident, then the police take the license. Laws must be put in place for the good of all. Yes I think it would be a good idea to tighten driving requirements for senior citizens ......just as soon as they do the same for those 25 and under. I've been driving since age 11, yes, 11, and have an excellent driving record – obviously I didn't grow up in a city..
All comments are valid, but with the majority of the population becoming aged perhaps funding some better transportation options so that the aged aren't stranded once they give up driving might be money well spent. I suggest everyone realize that they too will be faced with giving up the keys and the options are limited in still being able to be independent. It is also highly frustrating to hear of teenagers texting, soccer moms talking on the cell phone and drunk illegal aliens wiping out entire families. Accidents happen. Don't blame it all on the elderly. According to the CDC, in 2005, Seniors over the age of 65 accounted for 3% of the $99 billion dollars in medical (and in the case of a fatality, lost productivity). That's $3 billion dollars. If we can come up with a program to meet the transportation needs of Seniors for less than $3 billion dollars, let's do it. If not, don't do it. Looking at the statistics, it appears Senior citizens on the road are more of an annoyance instead of the threat. Should the laws be tighter for elderly drivers? Yes, safety is important, not to just the other drivers but to them as well. But since so many older drivers depend on their cars to buy food, medicine, get them to doctors appointments, and other activities the real question is what do you do for these people when you take their cars from them? So I suppose we will do what we Americans always do...just ignore the problem until someone really important or a mass group of people are seriously injured or killed. I just watched a woman in late 30's early 40's sitting at a yield sign with one hand occupied with a cellphone to her ear.and believe it or not a folder open on the steering wheel. She did a quick glance and pulled into traffic nearly getting rammed by cars. Who was worse? Her or a 75 year old.? Here's the deal. I am a 55 yr old driver. I drive the speed limit, and fight with other drivers on my rear bumper trying to pass me. I don't talk on my cell, use a laptop, nor do I have a DVD player in my car. I take defensive driving courses, and try to be careful when driving. So, when you lump a group of people together and say take the seniors off the road, think of younger irresponsible drivers who are drunk, high, on the phone, and cutting seniors off when we follow the rules of the road. Yes, irresponsible drivers should be taken off the road. But irresponsible drivers are of any age. Those driving faults actually describe the way a couple of my grandkids drive!! My husband gave up his licence when he drove to the wrong doctor in a different town. I told him no big deal. You've complained all these years that I get to see the sights. Now You can sit back and enjoy the view! If you can ride a bicycle or tricycle for 10 blocks in downtown, you are qualified for a driver's license. If seniors were mostly responsible for traffic accidents, I would say yes. Statistics say otherwise as the most dangerous drivers on the road and the ones who are in the most accidents are in the 16-19 year-old group. Seniors don't text and drive either and are generally the most law abiding group of drivers. Age has nothing to do with driving skills. Absolutely there should be restrictions. After the age of 70 or 75, we should begin requiring ANNUAL evaluations of the elderly to ascertain whether they are safe to continue driving. We need to especially pay attention to their eye sight and mobility. It doesn't have to be an extensive test (i.e. who cares how far behind the fire truck), but more of a motor test to make sure they can drive acceptably. Regular (bi-yearly?) testing of vision and reflexes should be done past 60-65 bracket... Oregon let my father at 86 renew his license for 8 years! with only a simple eye test... just the standard test... I was told by his Eye Doctor that he should not be allowed to drive... I had his medical doctor tell DMV to pull the license! The way some seniors handle the shopping carts in the grocery stores, you bet there should be mandatory testing. I often wonder how they drive themselves from point A to point B in their automobiles. Ah, no need to tighten the rules Jack. We are testing cars that drive themselves. Fuzzy logic sensors and the like to handle some of the decisions we once made. And frankly, grandma and grandpa are the only ones with the money to buy anything right now, so let them continue to drive. This stuff will be in major production withing the next 5 to 10 years. P.S. I just took the drivers safety course and passed it with flying colors on- line. It is much easier going in person to take it though. They asked questions that I would have failed many years ago. Yes, my ticket was for speeding........ not going too slow. Its not the older people who need more restrictions, its the younger people who are in the 16-21 age bracket who need tighter restrictions. Let me get this straight, some comments here; drive test every year= $$$ out of my pocket. Increase insurance cost dramatically for the elderly=$$$ out of my pocket, improve car technology to prevent accidents=$$$ out of my pocket. Drivers texting while going over the speed limit and hitting my car=$$$ out of my pocket. Sure I want to see the politician or public servant that tries to implement this. Let’s see how fast I vote for the other guy/girl. then we would just know to avoid them, Jack. I recently took my 82 yo grandmother to the DMV where she had to take an eye test. She struggled so much that the administrator started giving her hint after hint, and she still couldn't do it, so the lady asked "does it look like an L or and O etc... minutes later my grandmother finally finished the test. i wondered at what point do people actually fail these tests? the kicker, my grandmother drives a grand marquis, which is twice the size of my own car. Jack, just recently an elderly woman drove 10 miles on the wrong side of the road on the busiest highway in this college town. (College Staiton, Texas) She ignored motorists that tried to help her get off the road and turned around. There were dozens of calls to DPS to report it and when she was finally stopped she said she knew and would get off eventually. She wasn't even ticketed!! Something has to be done. I suggest testing them with a live person in order to renew after the age of 65. As a 76 year old who has not had so much as a parking ticket in the last 25 years...explain why I'm the problem. Cafferty your heart is in the right place but it wont happen. Simple reason, oldest people vote. It is sad and pathetic but politicians will not pass laws against older people driving for that reason. absolutely. I'm a private pilot, age 50, I'm tested every two years for proficiency. For driving, I think 70 is a the right age for skills/proficiency testing. Driving, like flying, is a privilege, not a right. Drivers that lack the skills are putting other lives at risk. Absolutely! I was struck head on by a 91 year old driver who was driving north in a south bound lane of the freeway that I was traveling south in. Thank god no one died but it was at that moment I knew I was still here to someday help regulations pass to limit elders access to drivers licenses. More transporation options need to be in place for the elerly to feel ok to make the decision to let go of their license for the safety of everyone else around them. The simple truth is that humans of all ages stink at driving on anything but open road and there is very little of that left. People drive two inches from one another and anyone who leaves three inches of space will find somebody cutting in front of them and doing so without signaling. Nobody signals. Its like people think its none of your business whether they're turning or not. What we need to do is finish developing the technology to let cars drive themselves and take the humans out of the equation. We'll improve fuel economy, save thousands of barrels of oil a week, cut travel times significantly, reduce accidents and people can do the really important stuff that humans are good at ....put on their makeup, drink their coffee, have meaningless conversations on their phones and send text's and Tweets.